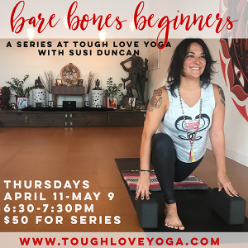 This series is for people who are ready to start a yoga practice in an intimate, welcoming environment with lots of guidance. We will explore asanas (poses) suited for the raw beginner and learn how to use modifications and props to help empower you to adapt the poses in our classes to your specific body and needs, meeting you right where you are. Susi will also introduce language often used in yoga classes and cover basic class and studio etiquette. Suitable for anyone who is brand new to yoga, is interested in re-entering the practice after some time away, or is recovering from injuries. Please let the teacher know if you have any specific injuries or needs at the first session. This series is for people who are ready to start a yoga practice in an intimate, welcoming environment with lots of guidance. We will explore asanas (poses) suited for the raw beginner and learn how to use modifications and props to help empower you to adapt the poses in our classes to your specific body and needs, meeting you right where you are. Susi will also introduce language often used in yoga classes and cover basic class and studio etiquette. Suitable for anyone who is brand new to yoga, is interested in re-entering the practice after some time away, or is recovering from injuries. Please let the teacher know if you have any specific injuries or needs at the first session.